People love their mobile devices; between gaming, social media, and simply browsing the web, more and more people are turning to a smartphone or tablet for their personal computing needs. For many, work now represents the most time they spend on a traditional desktop or laptop computer. This shift in personal computing is only going to get more pronounced as mobile devices get cheaper and more capable; why even bother purchasing a home computer for web browsing and light work when your tablet or even phone is already more than capable of it? It’s only natural that those same personal computing habits start to bleed into working hours. Users have started bringing their smartphones and tablets onto the work network and whether the administration likes it or not, it’s inevitable. Pushing back against users bringing their own devices, or actively trying to block them, adds aggravation and stress for everyone involved. Workplaces today seem to be faced with a simple choice: adapt to the changing times and institute a well thought out Bring Your Own Device (BYOD) policy, or waste valuable time trying to fight a coming tidal wave. To help workplaces cope with the changing landscape of personal computing, Google has unveiled “Android for Work,” which the search giant hopes will reign in the billions of Android devices and get them ready for their new part-time jobs as business tools. While it still won’t be easy to balance BYOD and overall security, standardizing a framework for the world’s most popular mobile operating system is definitely a step in the right direction. “Android for Work” builds on the multi-user support included in Android 5.0 by adding a dedicated profile on a user’s phone or tablet that separates business related applications and data from the user’s day to day profile (older releases of Android will require the installation of a special Android for Work application). When a user is under their personal profile they can use the device as they would normally, but once they switch over to the work profile, there is a completely different set of applications which are visually set apart by a small briefcase overlay on their icons. Google has also included “Google Play for Work”, which allows administrators to whitelist applications that can be installed while users are running their work profiles. Businesses can use this to not only control what applications are being run on their network, but to distribute their own internal applications without having to put them up on the main Google Play market or sideload them manually onto every users’ device. Applications can even be silently installed or removed remotely, so internal applications required for work can be automatically installed, or previously whitelisted applications which have found to be troublesome can be purged. It’s even possible to remotely wipe just the Android for Work profile without interfering with the rest of the files and applications installed. So if a user is no longer with the company or decides to stop using their personal device, the work profile can be remotely wiped and everything will go back to the way it was. Android for Work is definitely a big improvement to how mobile devices integrate into the business environment and will certainly help many businesses which are looking to strike a balance between convenience and security; but it still doesn’t solve the BYOD problem. The most glaring issue is, of course, users who bring in their devices without telling anyone. Android for Work can only control the devices which have been registered by the administration, it does nothing to control personal devices which users simply bring in and connect to the network without permission. Users sneaking in their personal devices without permission of the administration is arguably the crux of the BYOD issue to begin with. A complete BYOD solution still requires vigilantly protecting the network against incursions from any and all unknown devices. Deploying Android for Work won’t mean much if a user can freely connect their device to the network without anyone knowing about it. 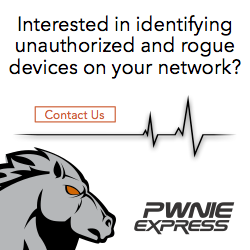 We have been talking for quite a while now about the obvious “rogue” devices hiding in your enterprise, but there is another issue highlighted in our post on gifts that has resurfaced again: potentially vulnerable devices within your network that are not obviously rogue. The security and privacy communities have been on absolute fire since news broke about the “Superfish” advertisement software Lenovo decided to pack in with some of their Windows-based machines in 2014. While everyone agrees that Lenovo pre-installing malware designed to push advertisements onto users’ screens is pretty, Superfish is looking to be considerably more dangerous than your standard manufacturer bloatware. Superfish messes up the HTTPS standard so badly that many in the industry have been left wondering how the companies involved could possibly have signed off on something so against standard security practices. Many are calling this the worst security gaff from a major tech player in recent history, and it has already been compared to the infamous Sony rootkit debacle of the mid 2000’s. Superfish has even gotten the attention of Homeland Security, which released a statement calling it a “critical vulnerability”. For its part, Lenovo claims they had no idea about the security implications of Superfish and have been working with Microsoft to get it automatically removed by Windows. Superfish is described as a “Visual Discovery” platform, essentially software that matches the content of images with what they actually are. The creators claim this software helps consumers do things like identify what items are even if they don’t know how to textually describe them. In the case of Lenovo computers, Superfish was included to analyze the images users were looking at and suggest advertisements that were relevant to them. So if the user was looking for images of dogs on their computer, they may start seeing advertisements related to animal adoption agencies while browsing the web. This is not unlike Google’s AdSense, just using images instead of text keywords to generate contextual ads. In other words, it might sound shady, but it isn’t something we aren’t already dealing with on a daily basis. The real problem is that Superfish was configured to intercept all of the data a user was sending out on the Internet, even if it was encrypted. It did this by installing it’s own self-signed root certificate, essentially making the computer think that Superfish was the issuing party for all SSL certificates. It then had free reign to view and modify the data the user was seeing in any way it wished, even though the browser said the page was encrypted and they had a secure connection to the site. In other words, Superfish performed a classic Man-in-the-Middle attack against SSL encrypted sites. A trick that usually requires taking over the entire network with specialized software was done out of the box by the friendly folks at Lenovo. If each installation of Superfish had a unique private key, this would still be an invasion of privacy on a large scale, but not exactly unheard of. For example, anti-virus software often installs a root certificate unique to each machine so it can check HTTPS encrypted sites for malicious code. But the company that provided Superfish with its SSL certificate, Komodia, decided to use the same private key for every certificate that got installed on a machine running Superfish. Which means anyone who has that key could fool a Superfish-equipt machine into believing they had a secure connection to any site they wished. It only took a few hours for the private key Komodia used to get discovered, aided in no small part to the fact that they decided to protect the key with the password: “komodia”. It’s becoming clear that more software than just Superfish was using the faulty Komodia private key. It’ll likely be awhile before the practical implications of the Superfish/Komodia software combination are fully known. How many machines are really affected? How likely is it for an attacker to leverage this against a victim in the real world? But in the end the real point here is that the software included on a new machine simply cannot be trusted in an era where companies are playing fast and loose with users’ privacy and security. A full wipe and operating system reinstallation should be standard operating procedure on any new computer, whether it’s for personal or for business use. With employees unaware of the potential dangers of their personal devices, it is vitally important to be aware of all devices connecting to your network. While few would argue that increased cybersecurity is something the nation should have a dialog on, the Summit was not without critics. Some questioned the White House’s motives when pushing for greater transparency and exchange of information with private industry, and there was the ever-present concern over privacy and respect of civil liberties. The true impact of the Summit on Cybersecurity and Consumer Protection won’t be known for some time, but there’s no question that it has already raised some very interesting points. At the Summit, the President explained that security was not something that either party should be working on in isolation of the other, “Government cannot do this alone. But the fact is that the private sector can’t do it alone either because it’s government that often has the latest information on new threats.” To this end, the President revealed his Executive Order entitled “Promoting Private Sector Cybersecurity Information Sharing”, which laid out the ground rules information exchange in as near to real-time as possible. The very mention of government exchanging data with private industry is a red flag for many privacy advocates, and for good reason. Collecting even cursory data about an individual’s Internet usage can divulge a treasure trove of personal information, and print an eerily accurate image of a person’s digital life. But a keen eye will note the second half of the sentence, which notes that any methods used must not interfere with “the ability of the Government to detect, investigate, prevent, and respond to cyber threats”. In other words, while protecting civil liberties is important, the government still needs to be able to fully utilize the data however they see fit if it is deemed to be an issue of national security. Despite the President’s hope that the Summit would bring together all the major players in the technology world, it seemed many companies didn’t take the event quite as seriously as the White House would have liked. According to Bloomberg, Facebook CEO Mark Zuckerberg, Yahoo CEO Marissa Mayer, and Google’s Larry Page and Eric Schmidt all turned down invitations to attend; leaving a conspicuous gap in attendance at an event that was supposed to represent the tech industry as a whole. Given the government’s track record, it should come as no surprise. Public opinion of the government in regards to civil liberties is at an all-time low, and tech companies are wary of being seen working closely with the government after the public backlash from the Edward Snowden leaks. While Google, Facebook, and Yahoo did send individuals from their respective security divisions to the Summit to take part in the discussions, the absence of their most forward-facing executives is a clear statement that the tech elite aren’t willing to publically work together with the government unless everyone is playing by the same rules. The top tech story over the last few days is certainly the announcement that health care provider Anthem, the largest for-profit managed health care company in the Blue Cross and Blue Shield Association, was the target of a massive data breach. All told, personal information on over 80 million customers has been leaked to an as of yet unknown attacker, making this easily one of the industries largest breaches. So while their customers credit card numbers may be safe, attackers seem to have made off with nearly every other important piece of information about their lives. Losing this much data, about this many customers, is absolutely huge. While customer data breaches seem to be becoming something of a monthly tradition as of late, they usually just include credit card numbers and maybe names; after all, most of these breaches have been at retailers. Demands that companies be held liable for loss of data in situations like this is nothing new and are unlikely to go away anytime soon with so much fuel being heaped onto the fire. This breach is yet another example of the increasingly sophisticated attacks being leveled against large corporations in an effort to smuggle out personal information. Given the gravely important nature of the data these companies hold on their customers, and the tenacity of those trying to steal said data, many believe government oversight of IT security processes is a necessary evil. While it’ll still be some time before we know if the government will directly step in on this case, we’re already seeing some individuals taking action. Bloomberg reports that a woman in California has already stepped forward with a lawsuit against Anthem, citing their failure to properly secure customer data. An interesting bit of news has recently come out of Russia, where the popular dating site “Topface” agreed to pay an attacker an unspecified amount of money to prevent them from selling a list of 20 million email addresses that had been stolen from their servers. Topface Chief Executive Dmitry Filatov was quoted as saying his company had, “paid him an award for finding a vulnerability and agreed on further cooperation in the field of data security”, but those in the security industry see it for what it really is: ransom. Calling this transaction anything other than an act of extortion is a dangerous precedent to set, and if condoned by the media, may end up causing headaches for other companies down the line. On the surface, it seems straightforward enough: the attacker, known as “Mastermind”, made off with 20 million customer email addresses and was attempting to sell them online, and Topface took him up on the offer and bought the email addresses themselves to prevent them from being released. Presumably the details on the attack would also be disclosed so Topface could plug up whatever leak let Mastermind make off with the data in the first place, which is likely what was meant by “further cooperation in the field of security.” The deal seems to be of questionable wisdom, but otherwise logical. But the story immediately sounds odd to anyone with experience in the security field. Email addresses, without context or additional data, aren’t worth a whole lot. The spam email industry is proof of just how common lists of millions of email addresses are; you don’t need to break into a company’s server to steal a list of email addresses, you can get those anywhere. So why pay Mastermind for something that didn’t have much street value to begin with? It seems likely there was more information at stake than what Topface is claiming, such as personal information or passwords. It could be that Topface is attempting to downplay the severity of the breach by saying only email addresses were compromised. Or perhaps what Topface was really purchasing wasn’t the data itself, but the information required to fix the initial vulnerability and potential backdoor from Mastermind’s attack. It may even be that there are some addresses on that list which wouldn’t go over well if the public saw them, such as those of politicians. It’s a facet of this story that we’ll likely never know, as there’s no reason for either party to spill the beans. But it would be nice to hear just what was so important that Topface was willing to make such a bold public move. In the end, the details of the attack and subsequent deal are moot. The real story here is the precedent that Topface has set for attackers looking to make a quick buck. Why disclose a vulnerability through the proper channels when you can just steal some data from the target and sell it back to them later? If one company is willing to suffer the slings and arrows of the tech media to get their data back, so will others. While bug bounties are a popular and increasingly common way to get your systems or code tested, there is an extremely important distinction between offering up a reward for penetrating your system and asking a company to pay you so you don’t reveal the data you’ve already stolen. Topface calling the money they paid Mastermind a “reward” is a simple gesture that makes them look better, but at the same time endangers the security industry as a whole.